When I unpack 'Pomegranate Juice' from my shopping bag into the refrigerator... I told D "Son, I am going to cook something exotic ... so... please, you are not to drink this". This is the first time I cooked 'something' from a Novel... and not a cookbook. 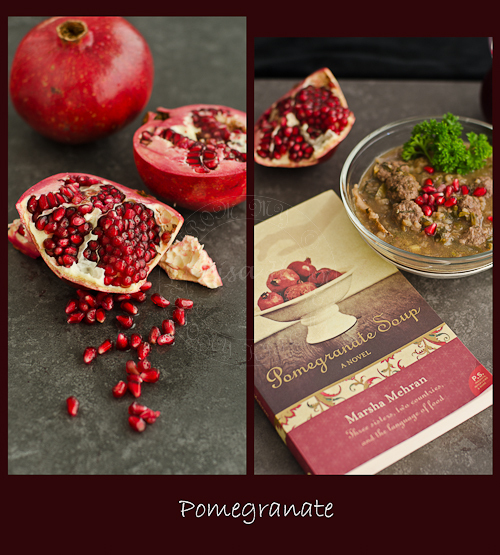 Reading Marsha Mehran's Pomegranate Soup... I was drawn to the characters, story line ... but I was more into the 'happenings' in their kitchen, the feeling was surreal... the smell of chopped onions, mints, parsley, exotic spices used, a pot of soup simmering on the stove... imagine... the exotic aroma billowing from the chimney of her character's kitchen... wafting through the sleepy town in Ballinacroagh, Ireland. It is one of the best 'humble' soups that I have tasted... It is light, smooth and tangy with burst of flavours... and the crunch of the pomegranate garnishes just 'Seal the Deal'. Oh .. one more thing... one of the ingredients in Marsha's Pomegranate soup is Angelica Powder. I hadn't a clue to what it was until I Googled... Angelica Sinensis to Persians and it is Dong Quay to Chinese. A 'Female Ginseng' as it benefits women health and well-being ...click here for further information. 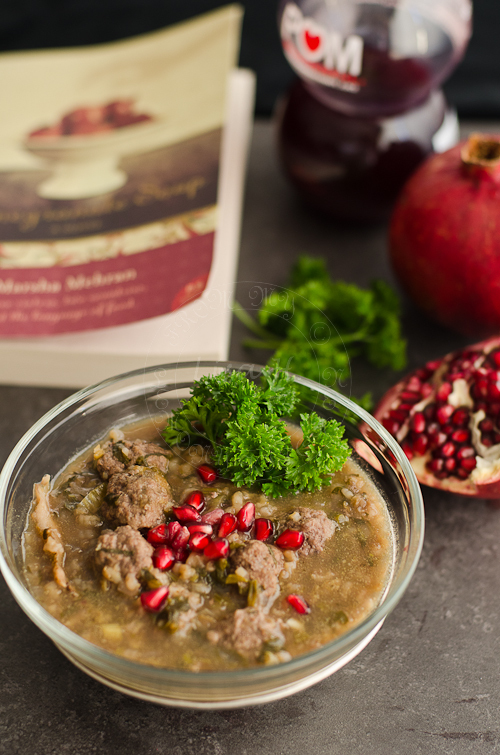 There are few more recipes in Marsha's Pomegranate Soup that I would love to give it a go... and perhaps blog about it..
Heat up olive oil in medium size stockpot, add onion and saute until slightly golden. Add lentils, basmati rice, water, salt, pepper and tumeric. Bring to a quick boil then lower the heat to a simmer, covered, for at 20 minutes. Add parsley, mint, cilantro, angelica roots or dong quay and spring onion. Add meatballs, pomegranate juice, lemon juice, sugar and season to taste (if needed). Stir gently as not to break the meatballs. Bring to boil then lower the heat to a simmer, covered, for 25 minutes*. 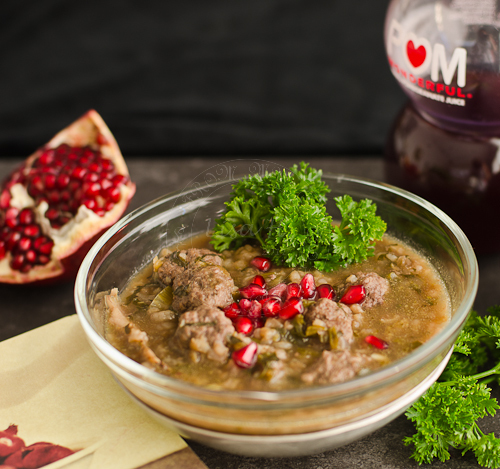 Serve with some fresh pomegranate. I love Middle Eastern food and that soup looks amazing! Gorgeous flavors. You had me intrigued ... dong quay with pomegranate and lemon juice. Just googled and landed in your blog. You have an amazing space and lots of lovely recipes. Happy to follow you. Please visit my space when time permits. Wow! Cooking from a novel? That must be a great one! The dish and photos look lovely as always. I really like your watermark, it's so subtle! Very nice! I'm not familiar with middle eastern food and this looks really appetizing! I'm impressed that you cooked this soup from a novel! Another gorgeous photography, Lisa! Don't be too hard on your son as I probably would have given you a similar look. ;) The only thing I could think of when hearing Pomegranate Soup was a cold sweet soup, maybe but nothing as hearty as the actual one. Lovely, just like the presentation! I did a quick search about the book and find it interesting that there really are recipes included! Hehe this is brilliant - a soup from a novel :-). It's a whole new trend in literature and cooking. I don't know the novel, but the soup must be amazing, with all these flavors. I think I might try something similar. 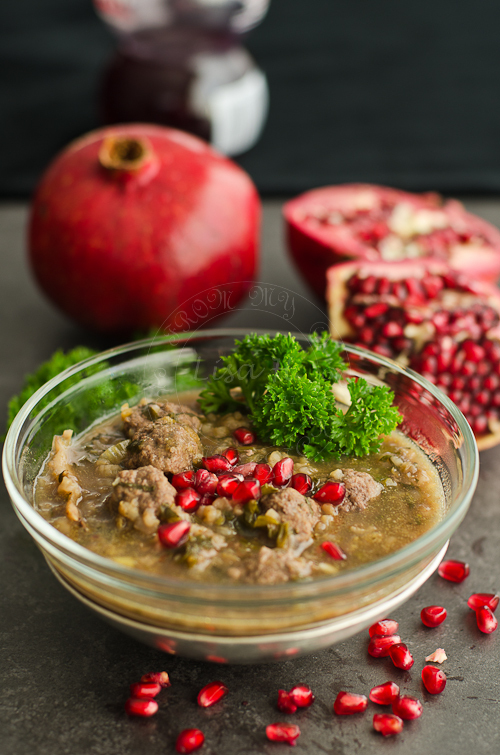 I am surprised to see dong guai used in Persian soup! Gorgeous Pictures. Never heard of this soup but scrolling through the ingredients, I knw I will love it. ..especially with those pretty ruby jewels!